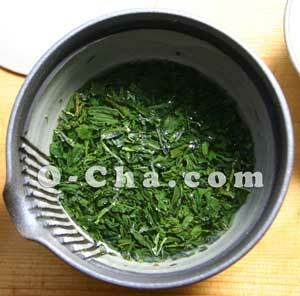 Gyokuro is not brewed like the normal sencha green tea one may normally encounter. 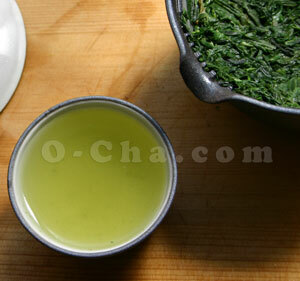 If brewed like sencha, although it may taste "okay", it will taste completely different than it should. The brewing temperature, brew time, and proportion of tea to water are quite different. Knowing this up front makes a world of difference. Then there is water quality to consider - why spend a lot of money on an expensive green tea and use city tap water? Good quality water is essential for making the perfect cup. This does not necessarily mean absolutely pure water with no minerals, but rather something a bit better than tap water. Minerals in the water can actually enhance the flavor of green teas. First, you will need a teapot. Take careful consideration on this as it can make all the difference. While you can usually use most standard Japanese teapots if you know what you are doing, there are two types of teapots which are especially suitable for brewing gyokuro - the houhin and the shiboridashi. 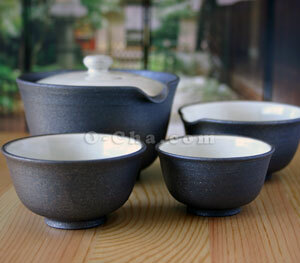 In our example, we will be using a shiboridashi teapot. Notice there is a teapot in the back, a yuzamashi (water cooler) to the right, and two small cups in the front. Hot water will be transferred from one vessel to another. This serves two purposes - to heat the cold ceramic and to simultaneously cool the water down to the proper temperature. Although it may seem ridiculously simple, this is really critical for success. The first thing you will want to know is how much water your teapot and teacups will hold. Fill them up and then pour the contents into a measuring cup. Water Temperature - This is where most mistakes are made. 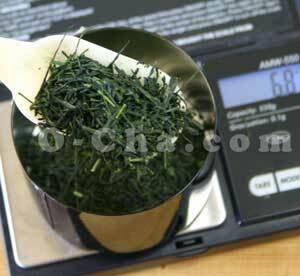 The proper brewing temperature for gyokuro is between 50C ~ 60C (122 F ~ 140 F) degrees. This is much lower than for sencha. Will 10 degrees make a difference? Yes! Here we are starting off with water that is 90 C (194 F). The hot water is first poured into the yuzamashi (water cooler) and allowed to sit for a minute or two. Most likely, the water temperature will have dropped to about 75 C (167 F) at this stage. 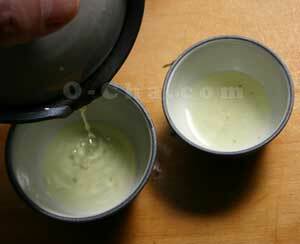 The water is then poured from the yuzamashi into the two small teacups and allowed to sit. Toss out any remaining water. Every time you transfer water from one vessel to another, the temperate will be lowered by about 10 C. While we are waiting for the water to cool a bit more, let's measure out some gyokuro leaf for our infusion. Proportion of tea to water - Very important! 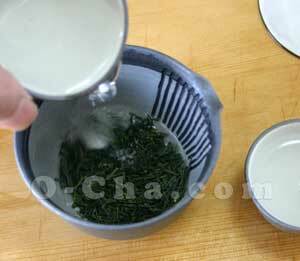 Generally speaking, gyokuro requires using double the amount of leaf that sencha does. The general guidelines is to use one gram (dry weight) of leaf for each 30 ml (one fluid ounce) of water. You can even go all the way up to two grams of leaf for each 30 ml of water if you have a very high quality gyokuro, but we recommend you start with one gram per 30 ml and work your way up from there. This is why it's important to know how much water your teapot holds before you even start. Also quite helpful is a small scale which measures to the tenth of a gram. In case you don't have one, it just so happens that one teaspoon is very close to 4 grams. 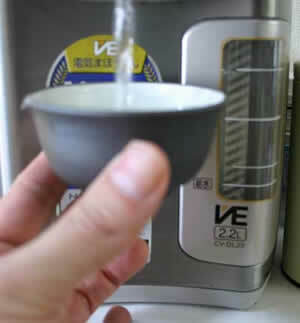 The two little cups of this shiboridashi tea set hold a combined 115 ml (3.9 ounces) of water. The leaf will soak up some of this. 115 ml divided by 30 ml comes out to 3.8 grams (dry weight) of leaf. So in this example, we'll round that up to 4 grams. One teaspoon will work very nicely. Add this to the waiting empty teapot. 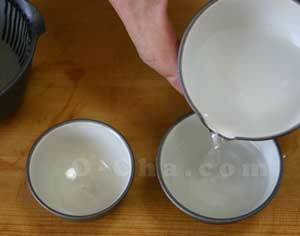 Pour the hot water from the two small cups directly into the teapot but do not cover the lid. The temperature will most likely drop into the ideal 50 C - 60 C temperature range for brewing gyokuro as the cold ceramic in the teapot soaks up the heat. With the lid OFF, watch from above for the leaf to uncurl a bit. This will take about 2 minutes, maybe 3 minutes maximum - longer than with sencha. Then put the lid onto the teapot. Pour little by little from cup to cup, going back and forth evenly. Near the end, carefully shake the teapot in a downward motion and try to get every drop possible into the two teacups. For your first infusion, you will most likely not fill the cups entirely as the dry gyokuro leaf will soak up quite a bit of the water but on subsequent infusions the cups should be quite full. Now you know how to brew gyokuro! You may now repeat the process 4 or 5 more times. It's not quite necessary to wait so long on subsequent infusions, anywhere from 30 seconds to one minute will do. Near the last infusion you can increase the time to get every last bit of flavor out of the leaf. Here is a GOLDEN tip for you! When you have finished - don't throw those wet leaves away, pour a little Kikkoman Ponzu Sauce on them and eat them - they are quite delicious!